A video taken by Sanzip Lama Tamang has gone viral on social media on Saturday. Facebook User Sanzip Lama posted a video at midnight that spread across a social like virus on Saturday. 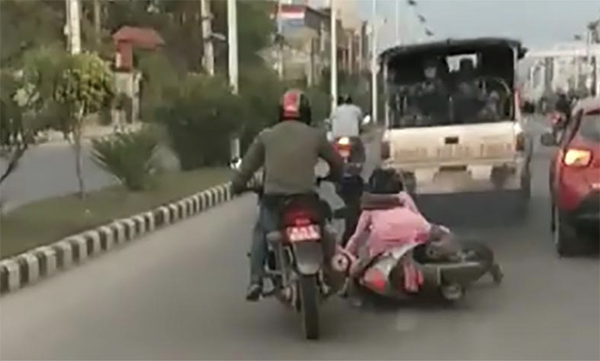 The video clip contains the footage of scooter rider struck by the security van of former prime minister Lokendra Bahadur Chand along the Naya Baneshwar-Maitighar road section. According to Annapurna Post the van no. Ba 1 Jha 9527 hit the scooter while escorting a VIP vehicle. Luckily, the scooter driver and the pillion rider remained unscathed except minor damage on a scooter. The accident happened at around 5 PM on Friday. After social media users started lashing out at the APF and the government for reckless driving, Valley Traffic Police and the APF jointly have started an investigation into the incident.